Anthropologist Diane E. King has written about everyday life in the Kurdistan Region of Iraq, which covers much of the area long known as Iraqi Kurdistan. Following the overthrow of Saddam Hussein’s Ba’thist Iraqi government by the United States and its allies in 2003, Kurdistan became a recognized part of the federal Iraqi system. The Region is now integrated through technology, media, and migration to the rest of the world. Focusing on household life in Kurdistan’s towns and villages, King explores the ways that residents connect socially, particularly through patron-client relationships and as people belonging to gendered categories. She emphasizes that patrilineages (male ancestral lines) seem well adapted to the Middle Eastern modern stage and viceversa. The idea of patrilineal descent influences the meaning of refuge-seeking and migration as well as how identity and place are understood, how women and men interact, and how “politicking” is conducted. In the new Kurdistan, old values may be maintained, reformulated, or questioned. King offers a sensitive interpretation of the challenges resulting from the intersection of tradition with modernity. Honor killings still occur when males believe their female relatives have dishonored their families, and female genital cutting endures. Yet, this is a region where modern technology has spread and seemingly everyone has a mobile phone. Households may have a startling combination of illiterate older women and educated young women. New ideas about citizenship coexist with older forms of patronage. King is one of the very few scholars who conducted research in Iraq under extremely difficult conditions during the Saddam Hussein regime. How she was able to work in the midst of danger and in the wake of genocide is woven throughout the stories she tells. 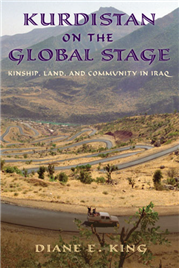 Kurdistan on the Global Stage serves as a lesson in field research as well as a valuable ethnography.